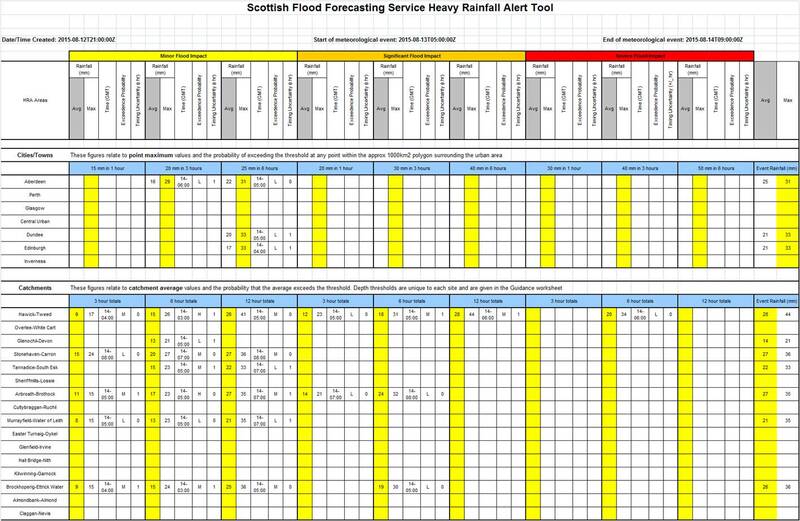 In order to provide probabilistic forecasts of flooding from surface water the forecasting service has been using a Heavy Rainfall Alert (HRA) tool since 2013, as discussed in a previous article. The tool consists of a spreadsheet that is updated four times a day and emailed to the forecasting duty officer, and a series of maps. After two years of use we have reviewed the tool and made some improvements to the spreadsheet, adding new functionality and making it more user friendly. As before, the tool uses MOGREPS-UK forecasts subjected to neighbourhood sampling (over 60km) to calculate the probability of exceeding depth duration thresholds (that have been defined in terms of expected impact), within specified operational areas. The new tool now has two key innovations. In the new tool an assessment of depth-duration threshold exceedence is made for each of seven urban areas. These areas are each around 1000km2, which is believed to be the optimum size for trading off event probability and usefulness of forecast. Now, by looking at the spreadsheet, the forecaster can see at a glance which urban areas might be affected. Previously, she would only have had information on exceedences within a larger area, and there might not have been any information immediately to hand to confirm whether or not the urban area was at risk. The other innovation relates to a new assessment of 16 catchments. These are all small, rapidly responding, flood prone catchments, where early warning of potential river flooding is required. Catchment average depth duration thresholds for various levels of impact have been calculated. The tool calculates exceedence of these thresholds by the areal average of these catchments, as opposed to the point maxima used previously. This is quite an innovation, and is the first time that the HRA process has been used in this way within the UK. In addition, a first guess risk tool has been built in to the spreadsheet, combining impact and likelihood. Maps, lists of thresholds and user guidance are also included to make the tool user friendly. As has been seen more than once this summer, the ability to focus risk based forecasts for surface water and rapid response catchments is critical to enable effective emergency response, and so the improved tool should go a long way towards helping us to meet that challenge. This entry was posted in Forecasting, Probabilistic, Risk communication, Surface Water. Bookmark the permalink.